Andrew Ager’s Führerbunker is a short chamber opera depicting the events leading up to Hitler’s suicide in April 1945. It’s a tautly constructed work in which many short scenes are woven into a seamless and compelling whole. It flies by and its 45 minute length seems even shorter. The score is spare, even brutal, as befits the subject matter. The composer told me he had initially envisioned something Wagnerian but feared that that must descend into pastiche. He made the right decision. So, the piano line is minimalist with elements of serialism and very little support for the singers. It’s a style that has perhaps been largely discarded (in north America at least) but here it was startlingly effective. Perhaps the crappy Tranzac Club piano contributed to the effect! 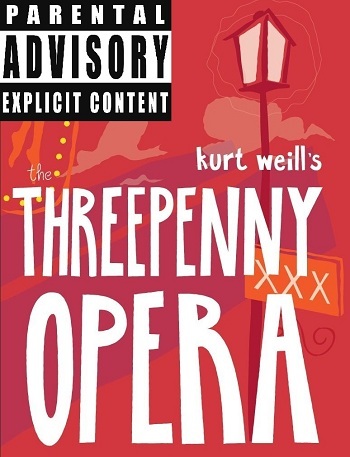 Last night I went to see Essential Opera’s cheap and cheerful production of Brecht and Weill’s The Threepenny Opera. It was a semi staged production in the relatively small Heliconian Hall. Semi-staged in this case meant sung in costume from music stands with very basic blocking. Accompaniment was by Cathy Nosaty on piano and accordion which actually suited the music pretty well. The singing was good, sometimes very good. Probably the stand out was Laura McAlpine’s Jenny. Of all the singers on display she was the one who seemed most immersed in the sound world of the piece and could vary style and technique appropriately. Erin Bardua’s Lucy Brown was really quite idiomatic too. The others were more consistently operatic which sounded a bit odd in places but worked surprisingly well in, for example David Roth and Heather Jewson’s rather refined refined and bourgeois Peachums. Obviously this approach also worked for the character who are usually sung operatically; Macheath, Brown and Polly for example. The ensembles were all also very effective.